I am pleased to open the July issue of the IEEE STC Newsletter, which offers to our two workshop reports and a technical contribution. Our Chair Niklas Carlsson summarizes the contributions to the ACM Greenmetrics 2017 workshop, whereas Dr. Athanasia Panousopoulou (Institute of Computer Science of the Foundation for Research and Technology - Hellas) reports on the CysWater 2017 Workshop. Prof. Antonio Skarmeta (University of Murcia, Spain) overviews the ongoing activities of the ENTROPY European Project, funded by the Horizon2020 Program. As usual, the newsletter closes with the list of upcoming conferences and workshops in the field of sustainable computing. We also provide the links to the CFP of the IEEE Access Special Section on “Social Computing Application for Smart Cities” an to the first issue of the enCOMPASS newsletter: a description of the aims and scopes of the enCOMPASS project appeared in our April 2017 issue and we are now glad to keep our readers updated about the latest progresses in the project activities. The eighth annual GreenMetrics Workshop was held on June 5, 2017 in Urbana-Champaign, IL, USA, in conjunction with the ACM SIGMETRICS 2017 conference. For the past years the workshop has been expanded from topics on the energy and ecological impact of Information and Communication Technology (ICT) systems, to include emerging work on the Smart Grid. Topics of interest fall broadly into three main areas: designing sustainable ICT, ICT for sustainability, and building a smarter, more sustainable electricity grid. The workshop brought together researchers from the traditional SIGMETRICS and Performance communities with researchers and practitioners in the three areas above, to exchange technical ideas and experiences on issues related to sustainability and ICT. The workshop program included three 45-min keynote talks, and eleven 20-min presentations of technical papers. In the first keynote ``Data and metrics for power grids and energy supply sustainability'', Peter W. Sauer, locally from UIUC, presented fundamental issues and opportunities for Direct Data Driven Applications as well as Data Analytics for energy delivery systems, which included the challenges of full utilization of renewable resources, customer interaction, energy markets, and optimal strategies. One particular focus was exploiting the vast supply of Phasor Measurement Units and the potential for model-less analysis and control. David Irwin from University of Massachusetts Amherst presented the second keynote talk, titled ``Staring at the Sun: Solar Energy Analytics and their Privacy Implications''. He first presented SunDance, a technique for disaggregating solar power from a building's net energy usage. Since the vast majority of solar deployments are ``behind the meter'', accurate solar disaggregation can significantly improve utilities' visibility into distributed solar generation. Unfortunately, solar energy data is not anonymous: since every location on Earth has a unique solar signature, it embeds detailed location information. To explore the severity and extent of this privacy threat, David continued to present SunSpot, a technique for localizing ``anonymous'' solar-powered buildings from their solar energy data. Our third keynote talk was by Thomas F. Wenisch from University of Michigan, titled ``Report from the Arch2030 Visioning Workshop: Where are Computer Architects headed and what does it mean for GreenMetrics?''. In June 2016, the computer architecture community engaged in a public visioning workshop to identify the key challenges in computer architecture research over the next 15 years. Thomas summarized the outcome of the workshop report delivered to the National Science Foundation and discussed possible implications for the Sigmetrics/Greenmetrics community. After considering many good candidates, the best student paper award was given to ``GPGPU Power Estimation with Core and Memory Frequency Scaling'', by Qiang Wang and Xianwen Chu from Hong Kong Baptist University. The authors proposed a fast prediction model based on Support Vector Regression, which can estimate the average runtime power of a given GPU kernel using a set of profiling parameters under different GPU core and memory frequencies. Overall, the papers presented at the workshop reflected a current concern of energy consumption associated with proliferating data centers, and other fundamental issues in green computing. The workshop incited interesting discussions and exchange among participants from North America, Europe, and Asia. The combination of global warming effects, the rapidly expanding water crisis, and the aging infrastructures are challenging factors that water policy makers consider to promote sustainable solutions for water resources utilization. The water industry has therefore drawn novel directions, which feature the most recent advances in sensing, networking, processing, and control. In this continuous effort, Smart Water Networks (SWN) have an inherited dependence on Cyber-Physical Systems (CPS), since the latter provide the technological suite to deliver reliable, scalable, and secure architectures in highly-adapting environments. Nevertheless, numerous technical and research challenges must be jointly addressed. Front-end raw sensing should be elevated to collaborative edge-processing; learning and networked control techniques should be combined with scalable computing architectures to efficiently address the necessity of timely failure detection and isolation; novel paradigms on security and safety against contamination should be embedded to water infrastructures. It becomes obvious that the success of SWN in becoming the sustainable technology for overcoming water crisis depends on bridging the gap between researchers and engineers from the CPS community, practitioners from the Water Industry, and water policy makers and end-users, in order to both share their experiences, as well as formulate novel CPS paradigms for fulfilling the vision of SWN. This has been the motivation of organizing the 3rd International Workshop on Cyber-Physical Systems for Smart Water Networks (CySWater 2017) as part of the Cyber-physical Week 2017 in Pittsburgh, US. The theme of the workshop was oriented at signal processing, networking, and security for smart water infrastructures, while exploring emerging topics in the Water Management arena. The technical program  of CySWater 2017 consisted of two keynotes, and 11 full research papers, which have received full indexing by the ACM Digital Library . Highlights of the event were the keynotes given by Mr. Grant Ervin, Chief Resilience Officer for the City of Pittsburgh, and by Dr. Mahta Moghaddam, Professor of Electrical Engineering, University of Southern California and Director of the USC Arid climate and Water Research Center. Mr. Ervin explained the importance of intelligent water infrastructures for shifting from smart to sustainable and resilient cities, and the impact of dynamic and inclusive urban communities for mitigating risks associated with decaying infrastructure. Prof. Moghaddam elaborated on the significance of quantifying fresh water for designing sustainable solutions, in the light of the rapid increase in world population and the emerging water crisis. Especially for the case of surface-to-depth profiles of soil moisture and ground water, numerous technical challenges remain in developing an affordable, accurate, and practical observing system for both soil moisture and ground water. Prof. Moghaddam presented the critical problems in remote sensing of water resources today, and discussed how USC addresses these problems by developing new microwave sensor technologies for ground-based, spaceborne, and airborne radars, as well as in-situ sensors and sensor networks, towards creating ubiquitous elements of a global water observing system. We are grateful to the CPS Week 2017 organizers, IEEE, as well as the workshop’s delegates for making CySWater2017 a successful event. Motivated by the acclaimed necessity of bringing together the CPS research community and the Water industry, the 2018 edition of CySWater is planned to be hosted at Porto, Portugal, while expanding the call towards water management standardization and policy making. Information and Communication Technologies (ICT) could be instrumental in the use of abatement technologies that address these energy consumption inefficiencies. It is estimated that ICT offer the potential to reduce annual emissions in the buildings sector by 1.68 GtCO2e by 2020, while in parallel producing emissions that are substantially lower than the ICT-enabled abatement potential . However, it should be noted that even with full-scale deployment of novel and energy efficient ICT solutions, without the right incentives or motivation to change, behaviour can be a major barrier to adoption. Thus, the deployment of energy efficient ICT solutions has to be accompanied by active engagement of the buildings’ occupants towards the effort to increase the overall environmental friendliness of the buildings. This can be achieved by increasing the overall awareness of consumers regarding the main causes of energy consumption, the impact on the environment as well as the potential for energy and cost savings and providing the proper motives for changing their daily lifestyle in a way that better quality of life will be achieved . Taking into account the need for reducing energy consumption and the potential offered through ICT, ENTROPY project funded by the Horizon 2020 European funding program under the topic EE-11-2014 - New ICT-based solutions for energy efficiency, aims at the design and deployment of an innovative IT ecosystem targeting at improving energy efficiency through consumers understanding, engagement and behavioural changes as well as support of energy-aware characteristics of the IT equipment. Focus is given on the collection of energy-related information from heterogeneous data sources, the proper analysis of the available data and the provision of interactive services, applications and serious games to end users for stimulating their interest for energy efficient activities, recommending actions for adopting more energy efficient lifestyles and increasing their overall energy consumption awareness. 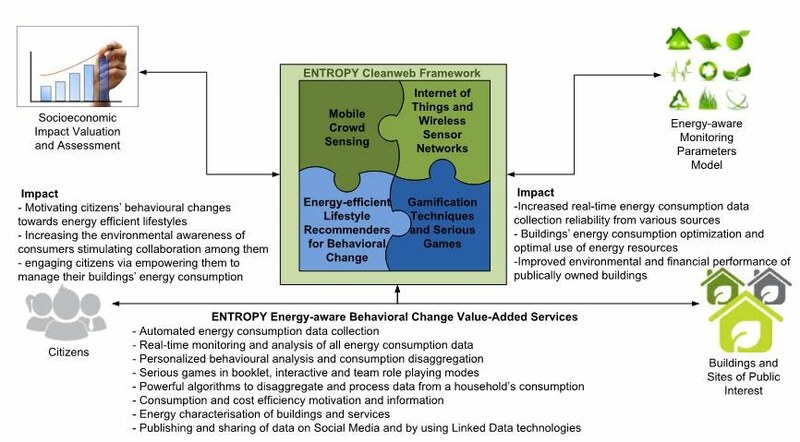 The vision of the ENTROPY project (Figure 1) is to design and deploy an innovative IT ecosystem for motivating end-users’ behavioural changes towards the adoption of energy efficient lifestyles, building upon the evolvements in the Internet of Things, Data Modeling and Analysis and Recommendation and Gamification eras. 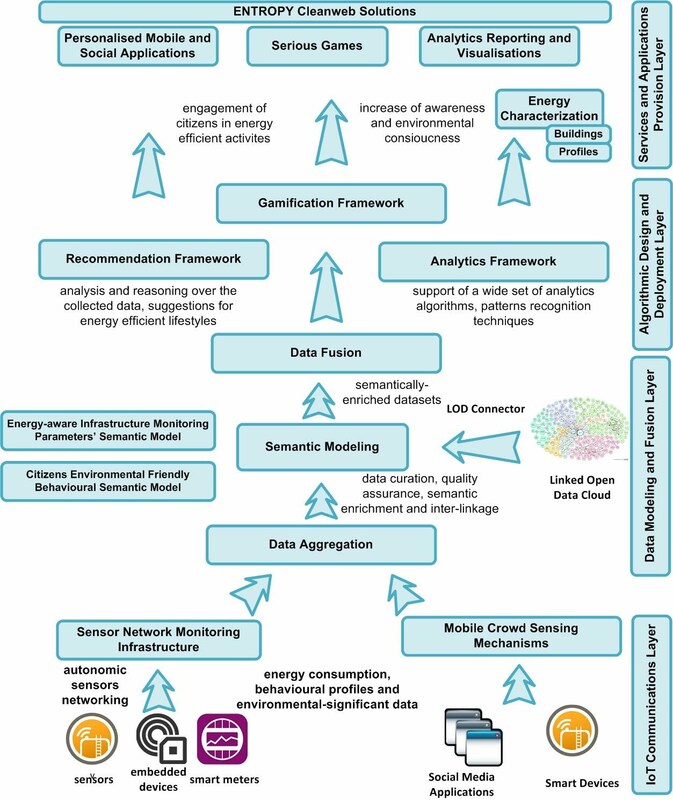 The ENTROPY project proposes mechanisms that adopt novel IoT and Data Management principles, aiming at the provision of an innovative IT ecosystem that will provide a set of services and applications targeted to behavioural changes of citizens with regards to the adoptions of energy efficient lifestyles and the improvement of the ecological footprint of buildings. The project’s vision for achieving such a behavioural change as well as the provision of energy efficient ICT solutions is based on four fundamental concepts; advances in the Internet of Things based on the support of IPv6 characteristics and autonomic networking functionalities, advances in Data Modelling and Fusion mechanisms for meaningful representation of the available data and extraction of advanced knowledge and analytics, advances in the design of Recommendation mechanisms for the provision of environmental friendly oriented recommendations and advances in the design of Gamification techniques for the provision of the fundamental building blocks towards the development of serious games  . The ENTROPY IT ecosystem conceptual architecture (Figure 2) is consisted of four layers, each one of them with a discrete role and a set of assigned functionalities: the IoT Communications Layer, the Data Modeling and Fusion Layer, the Algorithmic Design and Deployment Layer and the Services and Applications’ Provision Layer. Internet of Things technologies are exploited for the proper and energy efficient interconnection of a heterogeneous set of sensor nodes (e.g. smart energy meters, sensors interacting with microgeneration infrastructure, sensors in smart phones), the collection of data based on Mobile Crowd Sensing Mechanisms exploiting the power of the collection of data from a critical mass of interested people and the application of proper communication networking schemes with regards to data collection. Advanced Data Modeling and Analysis techniques are applied for the modelling of the collected data –both from sensor networks as well as directly from end users- and the extraction of advanced knowledge by exploiting the power of Semantic Web techniques, Linked Data and Data Analytics . Focus is given on the development of personalised mobile applications and games targeted at providing energy related information to end users, triggering interaction with relevant users in social networks (e.g. users in a specific area within a city), increasing their awareness with regards to ways to achieve energy consumption savings in their daily activities and adopt energy efficient lifestyles based on a set of recommendations and motives targeted to their culture. The engagement and direct inclusion of end users within the diverse components of the provided IT ecosystem is going to be strongly supported. ENTROPY project  is complemented by Spanish project EDISON  - Emerging Dynamic Intelligence on Smart Cities Services based on IoT technologies- TIN2014-52099-R granted by the Ministry of Economy and Competitiveness of Spain (including ERDF support). EDISON looks for advanced research based on the deep analysis of the data provided by extensive usage of the IoT, in order to facilitate the emergence of the intelligence of the collected information from networked things to be able to understand hidden patterns and human/group behaviors to provide urban dynamics knowledge for Smart Cities applications. In that sense EDISON looks for discovery behavioural pattern by the use of Softcomputing and Data Mining techniques, with application to Smart buildings scenarios like the one proposed by ENTROPY, providing a relevant synergy for the research objectives of both projects. C. Perera, A. Zaslavsky, P. Christen, and D. Georgakopoulos. Sensing as a service model for smart cities supported by internet of things. Transactions on Emerging Telecommunications Technologies, 25(1):81-93, 2014. A. Fensel, V. Kumar, and S.D.K. Tomic. End-user interfaces for energy-efficient semantically enabled smart homes. In Energy Efficiency, 2014: 1-21. M. Victoria Moreno, Benito Úbeda, Antonio F. Skarmeta and Miguel A. Zamora. How can We Tackle Energy Efficiency in IoT Based Smart Buildings? Sensors, Volume: 14, Issue: 6, p. 9582-9614, 2014. EDISON Project. Available Online: http://www.um.es/web/edison/.